The National Book Awards are open for 2018 submissions. Established in 1950, the National Book Award is an American literary prize administered by the National Book Foundation, a nonprofit organization. A pantheon of such writers as William Faulkner, Marianne Moore, Ralph Ellison, John Cheever, Bernard Malamud, Philip Roth, Robert Lowell, Walker Percy, John Updike, Katherine Anne Porter, Norman Mailer, Lillian Hellman, Elizabeth Bishop, Saul Bellow, Donald Barthelme, Flannery O’Connor, Adrienne Rich, Thomas Pynchon, Isaac Bashevis Singer, Alice Walker, Charles Johnson, E. Annie Proulx, and Colum McCann have all won the Award. Each year, the Foundation selects a total of twenty Judges, including five in each of the four Award categories: Fiction, Nonfiction, Poetry, and Young People’s Literature. Historically, Judges are published writers who are known to be doing great work in their genre or field, and in some cases, are past NBA Finalists or Winners. As of 2013, judging panels will no longer be limited to writers, but now may also include other experts in the field such as literary critics, librarians, and booksellers. One of the five Judges on each panel is selected as the panel chair. This person acts as the voice of the panel and the liaison to the Foundation. The Foundation staff takes no part in the Judges’ deliberations, except to verify a submission’s eligibility. Each spring, the Foundation sends the official National Book Awards guidelines and entry forms to the publishers in its master database. Those publishers who do not receive the materials automatically can call or email the Foundation to request a copy. Authors cannot submit their books themselves; they must have their publishers contact us directly. However, the guidelines are always available for informational purposes here: www.nationalbook.org/nbaentry.html. In order to be eligible for the Award, a book must be written by an American citizen and published by an American publisher between December 1 of the previous year and November 30 of the current year. Self-published books are only eligible if the author/publisher publishes the work of other authors in addition to his own. Books published through services such as iUniverse are not eligible for the Award. Each publisher must submit a completed entry form to the Foundation by May 15. They must then mail one copy of each entered book to the Foundation, as well as one copy to each of the five Judges in the appropriate category, by July 1. The entry fee is $135 per book. Each panel reads all of the books submitted in their category over the course of the summer. This number typically ranges from 150 titles (Poetry) to upwards of 500 titles (Nonfiction). As of 2013, each panel will now compile a “longlist” of ten titles, to be announced in mid-September. They will then narrow down that list to five Finalists, to be announced in mid-October. They may arrive at these choices using whatever criteria they deem appropriate, as long as they do not conflict with the official Award guidelines. No one, not even the Foundation staff, learns who the Winners are until the day of the National Book Awards Ceremony and Benefit Dinner, which takes place in mid-November in New York City. That afternoon, over lunch, each panel collectively decides who the Winner in their category will be. Often, this decision has been made ahead of time, but occasionally the panel works to come to a consensus until the very last minute. The panel chair announces the Winner at the Ceremony that evening. The night before the Awards, each Finalist receives a prize of $1,000, a medal, and a citation from the panel at a private Medal Ceremony. Immediately following the Medal Ceremony, all twenty Finalists read from their nominated books at the Finalists Reading. The four Winners in Fiction, Nonfiction, Poetry, and Young People’s Literature are announced the following evening at the National Book Awards Ceremony and Benefit Dinner, where each Winner receives $10,000 and a bronze sculpture. 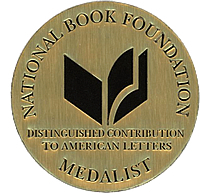 Once an author has been a National Book Award Finalist or Winner, he or she becomes a permanent member of the National Book Foundation family. We do our best to keep in touch with both the authors and publishers, promote the authors’ new books and upcoming readings, and invite them to future National Book Award-related events. Check us out on Facebook, Twitter, and Tumblr to see how we continue to support past Winners and Finalists all year round. Thank you for this timely article for our writer’s groups and coaching clients. Happy you saw it. It is such a great resource for our readers.